The Real Story of WWII's B-17 "All American"
Stricken B-17 "All American" miraculously flying after collision with a German fighter, photographed by the crew of another bomber in her formation. photographed by the crew of another bomber in her formation. We got this email in our inbox the other day, purporting to tell the story of the Boeing B-17 Flying Fortress, “All American.” The story, accompanied with some incredible pictures, told of the plane, mortally wounded, getting her crew home safely. We were pretty sure we had seen this email, sent from a friend (who got it from a friend, who got it from a friend, ad infinitum) before at some time in the past, but reading it over, some things about the chain email just didn’t make sense, so we decided to do some research. We’ve decided to reproduce the email, as it’s certainly compelling prose, however it’s fiction. A mid-air collision on February 1, 1943, between a B-17 and a German fighter over the Tunis dock area, became the subject of one of the most famous photographs of WWII. 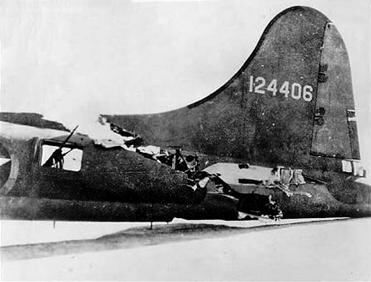 An enemy fighter attacking a 97th Bomb Group formation went out of control, probably with a wounded pilot then continued its crashing descent into the rear of the fuselage of a Flying Fortress named “All American”, piloted by Lt. Kendrick R. Bragg, of the 414th Bomb Squadron. When it struck, the fighter broke apart, but left some pieces in the B-17. The left horizontal stabilizer of the Fortress and left elevator were completely torn away. The two right engines were out and one on the left had a serious oil pump leak. 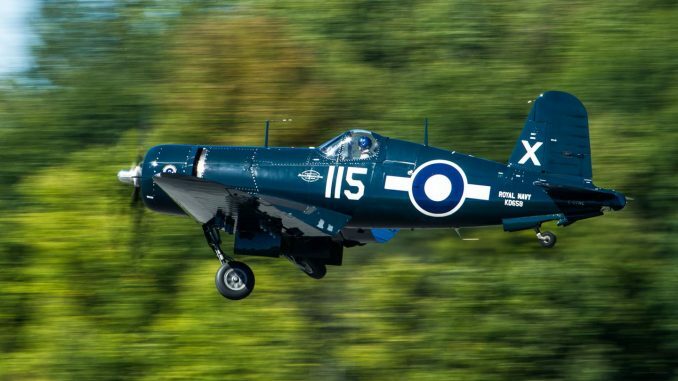 The vertical fin and the rudder had been damaged, the fuselage had been cut almost completely through, connected only at two small parts of the frame and the radios, electrical and oxygen systems were damaged. There was also a hole in the top that was over 16 feet long and 4feet wide at its widest and the split in the fuselage went all the way to the top gunner’s turret. Although the tail actually bounced and swayed in the wind and twisted when the plane turned and all the control cables were severed, except one single elevator cable still worked, and the aircraft still miraculously flew! 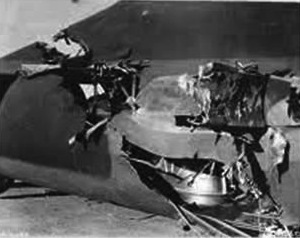 The tail gunner was trapped because there was no floor connecting the tail to the rest of the plane. The waist and tail gunners used parts of the German fighter and their own parachute harnesses in an attempt to keep the tail from ripping off and the two sides of the fuselage from splitting apart. While the crew was trying to keep the bomber from coming apart, the pilot continued on his bomb run and released his bombs over the target. Allied P-51 fighters intercepted the “All American” as it crossed over the Channel and took one of the pictures shown. They also radioed to the base describing that the appendage was waving like a fish tail and that the plane would not make it and to send out boats to rescue the crew when they bailed out. The fighters stayed with the Fortress taking hand signals from Lt. Bragg and relaying them to the base. 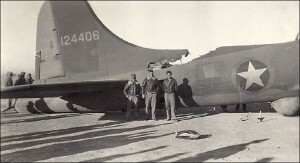 Lt. Bragg signaled that 5 parachutes and the spare had been “used” so five of the crew could not bail out. He made the decision that if they could not bail out safely, then he would stay with the plane to land it. 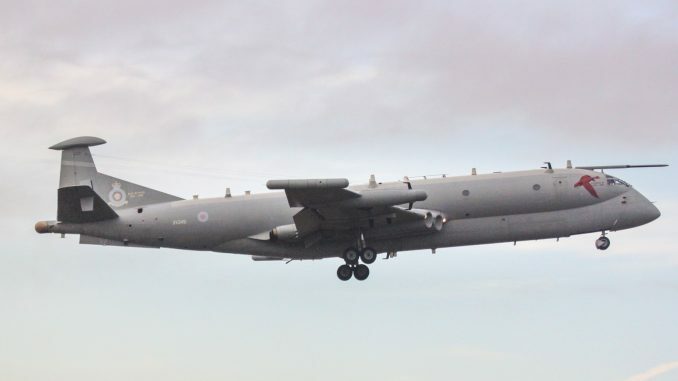 Two and a half hours after being hit, the aircraft made its final turn to line up with the runway while it was still over 40 miles away. It descended into an emergency landing and a normal roll-out on its landing gear. When the ambulance pulled alongside, it was waved off because not a single member of the crew had been injured. No one could believe that the aircraft could still fly in such a condition. The Fortress sat placidly until the crew all exited through the door in the fuselage and the tail gunner had climbed down a ladder, at which time the entire rear section of the aircraft collapsed. This old bird had done its job and brought the crew home and all in one piece. I love these old war stories especially the ones with a happy ending! Maybe pass this on to someone who will also appreciate this amazing story. The “All American” was actually based near Biskra, Algeria, a much more reasonable +/- 300 miles from Tunis. On the fateful day in question, the All American was part of a formation of bombers attacking the German-controlled seaport. Braving heavy flak and German fighters on the way in, the “All American” and her crew managed to drop their bombs and were on their way back to base when the German fighter planes began attacking again, pursuing them to the fighters’ maximum return range, when the attacks ended. However, two more Messerschmitts appeared and came in for the attack. One of the fighters went straight for the nose of the lead bomber of the formation and the other came for the nose of “All American.” The crew of “All American” fired at the plane coming for them from their nose turret while firing at the fighter heading for the lead bomber from the right side nose gun. Between the fire of All American and the lead bomber, the fighter going after that plane was disabled and sent down, smoke pouring from it as it descended. The fighter that was attacking the “All American,” head-on and guns blazing, began a roll to pull away, but halfway through the maneuver, gunfire from either “All American” or the lead bomber must have killed or incapacitated the fighter pilot and the plane never completed the collision-avoiding maneuver. 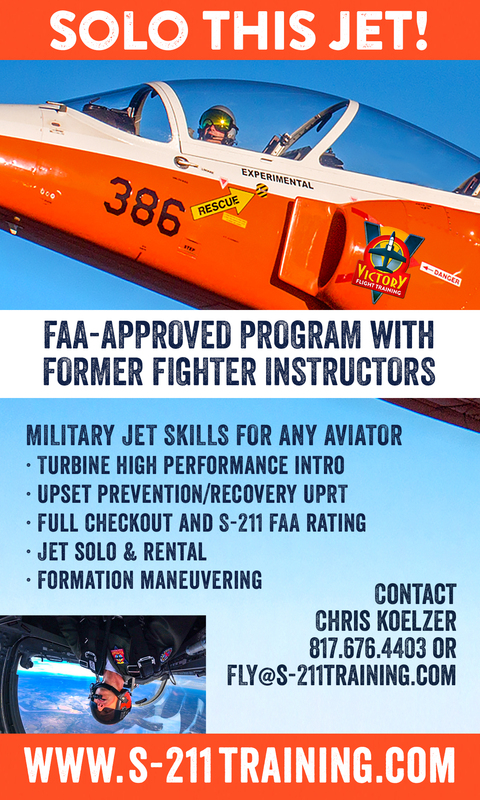 The fighter passed over ‘All American,” to say with inches to spare would be inaccurate as the plane tore a significant hole in the rear of the fuselage and removed the left horizontal stabilizer. The remaining parts of the tail section, the vertical and right stabilizer seemed like they could shake loose at any moment. Miraculously, none of the B-17’s crew were injured and the men all donned their parachutes, ready to abandon the plane should the tail break off. 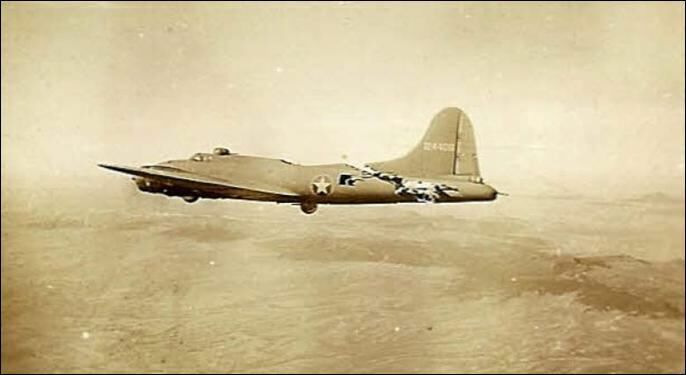 The other crews in the formation, seeing that the B-17 was crippled, but remaining aloft, slowed to a speed the injured bird could maintain and formed a formation around her until they were out from enemy territory. Once the formation was outside of the maximum range for the German fighter planes, the rest of the formation went on ahead and “All American” limped on alone. The Flying Fortress landed safely, though without her tail wheel which unsurprisingly was inoperative. 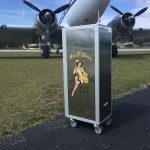 As one would imagine making it safely to the ground was an emotional experience for both the flight and ground crews, a testament to the bravery of her crew, her compatriots and the legendary robustness of the Boeing B-17, that stands quite well all on its own without the additional fantastical embellishments. 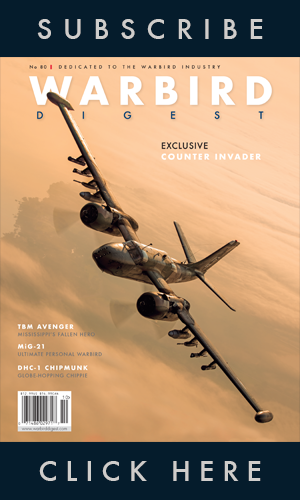 There is an excellent article with an interview with Ralph Burbridge, the bombardier on “All American” in which you can read his first person account of this mission, as well as his other wartime experiences, though the article incorrectly introduces a bit of misinformation of its own. * Sadly, Burbridge passed away earlier this year at the age of 93. *The Harold Adamson and Jimmy McHugh song “Comin’ in on a Wing and a Prayer” was not written about “All American.” The hit song, released in 1943, recounted the amazing survival of another 97th Bomb Group B-17, “Thunderbird.” The plane had been given up as lost on a January 12, 1943 mission to Tripoli but her pilot, Lieutenant John Cronkhite managed to get her back to Biskra though thoroughly shot up, with both starboard engines out and fuel tanks nearly dry. He landed with no brakes and ground-looped the plane when he ran out of runway, but that’s a story for another day. Both “fact” & “fiction” are great story’s! Either way, the crew responded with incredible courage. Why does it appear that engine 1 is missing it’s prop? My guess would be that by the time that particular photo was taken the props had been removed for parts salvage. Looks like Eng 3 and 4 a missing props too. And there working under engine 2 which is the o ly one to appear to have a prop so my guess would be taking them off too. It’s a spectacular tale, but even your “revision” has some inaccuracies. The true story is that the American 97th Bomb Wing, based in Algeria, flew a mission to the Tunisian port of Bizerte, not “Tunis Dock”. When they were returning home, about 50km west of Tunis, a German Bf109G fighter, piloted by a 16-victory ace, Erich Paczia, crashed into the B17 leading the formation, “Flaming Mayme”, destroying it. 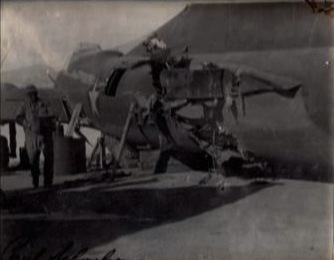 The remains of Paczia’s aircraft then went on to strike the tail of the photographic subject – B17 “All American III”. Paczia and seven of the crew from B17 “Flaming Mayme” were killed, and another three members of the “Flaming Mayme” crew became POWs (named Birk, Knight and Blair). Thank You James O ! When I find accounts like this I ALWAYS wonder what has been left out ! All to often these stories are chopped and sauced for various reasons. Where did you get this information by the way ? Reading your remarks about this B17 incident, it appears that you are very well versed in bombing raids from Tunisia in early 1943. My father’s cousin, whom I just discovered existed about a year ago, was a navigator on a B17 that was hit by flack and crashed. There were 8-9 parachutes seen, if I am reading the right information. It was either April 12th or 13th in Castelventrano, Italy. I’m looking for any information that may be available. His aircraft was 42-24394 and the MACR #16302. His name was Harry Arthur Wann, Jr. 301st BG, 353rd squadron. My uncle is still alive and in his early 90’s. They were childhood friends. He doesn’t know this history of his cousin, at least not what role he played or even that he was on a B17. He was in Luzanne in Infantry. James, I just saw your message and I want to thank you. My Great Uncle Edward Smith was on the Flaming Mayme he was the top turret gunner and was one of the 7 who lost their life that day. I have some insight into this, as Sam Sarpolus was my great uncle. 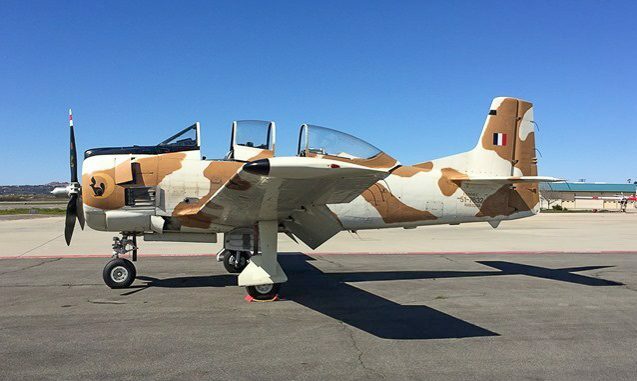 Yes, they were based in North Africa. The hit was, according to him, delivered by the Me109. The pilot was believed to have been dead at the controls. The communication lines were severed–the surviving crew believed him to be dead until he tried to climb forward. This incident got him the nickname “Lonesome Sam”. He survived the war, was wounded (later mission) and lost part of his left hand. He returned and started a farm in St. Clair, MI, served as a police constable, then retired to Tucson, AZ, where he passed in the late 1980s. I have some flight line photos, crew photos, and my great uncle’s dress uniform tucked away. Those pictures would be fabulous.If you care to share them with us please contact me. I am curious as to the Radio Operator on the B-17 “All American”. His name was shown as Paul A .Galloway. I had a Half brother by that name. He was in the Air Force in the late or middle 1940’s. Paul Arnold Galloway. He died in 1948 of TB. in Arizona. It you have ant info on him I would be pleased to receive it. 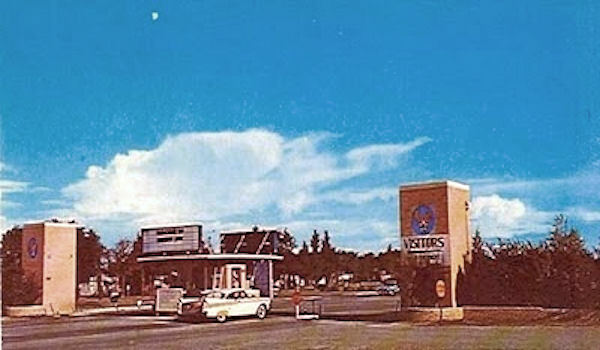 Yes, remember Sam telling me as a kid about that amazing day when we would visit the dairy farm in St. Clair. Sam Sarpolus was my Uncle, my Dads brother small world. If you get this I have added my email address above. It appears we are related Take Care. Correction: right hand was maimed, not left. Anyone know Charles Foley, an enlisted Air Corps photographer on another aircraft on that mission? Well GOD Bless your father and all of you descendants. I had an uncle navigator that flew in a Coronado crew. He and another crew member had disentary and had also completed their mission total, but the crew didn’t want to break up so they continued to fly and were shot down in the Celebes Islands. They were all beheaded by the Japanese after they dug their own graves. The report was collected from Nuns living on the island and were eye witnesses. There is a good book on these crews “Black Cat Raiders of the Pacific”. 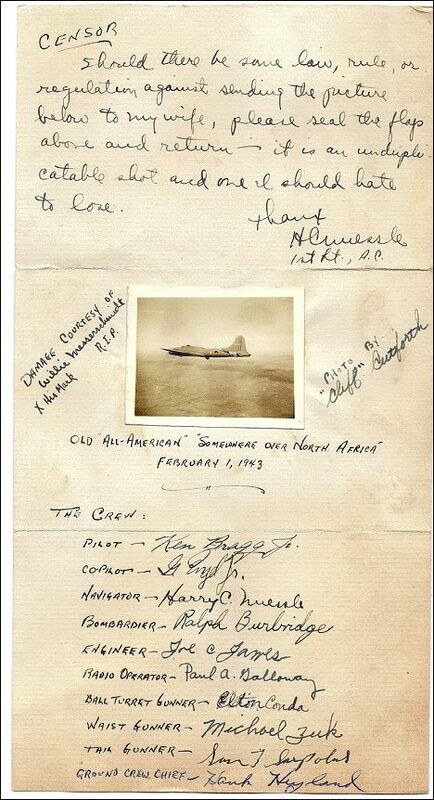 If I may politely offer a correction to a recurring error: The copilot on ALL AMERICAN was a LT Godfrey Engle (whose signature is hard to read). 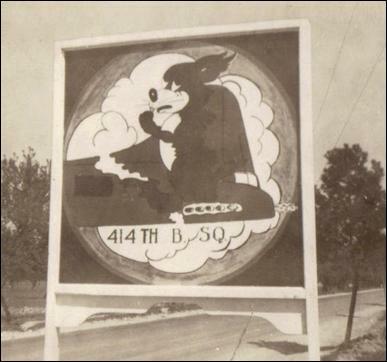 Engle deployed with the 414th BS, 97th BG and was an instructor pilot at Rapid City Army Air Base following his combat tour. I personally met the man and saw the originals of many of these pix in his photo album, to include PM Churchill touring their base. LT Boyd’s famous 100th BG would have flown from England, while ALL AMERICAN’s 97th BG operated from North Africa. LT Boyd may have survived a different collision over Europe; it happened a lot. Just wanted to say that I have a Shadow Box that was left to me by my Grandfather. He was in the Plane next to this. He had taken the picture and I have it in a shadow box with his medals. My aunt which is his daughter has the issue of LIFE Magazine that has the picture on the cover. There were only a few because LIFE didn’t have rights at the time to put it on the cover at the time. Hello. My uncle, Curtis A. Reese, flew as bombardier in B-17F that was shot down 9/23/1943 over Hannover, Germany. It was said to be the FIRST lost USA plane after Allies started night bombing. They had partial RAF support. This was from 422nd Squadron, 305th Bomb Group, Chelveston, England. Can you verify this? Thank you. Perhaps you can clarify the circumstances of the raid your uncle’s aircraft was lost on. Was it a night time raid? The RAF had been conducting their heavy bombing efforts against Axis forces more or less exclusively at night from well before significant US involvement in the European conflict. The first RAF 1000 bomber raid (against Cologne) took place on the night of May 30th/31st 1942 as an example, but smaller efforts had occurred almost nightly for some time before that. The strategy for the US forces raiding during the day, followed by the RAF at night took effect during 1942, but it wasn’t until early to mid 1943 that the US strategic bombing offensive took effect with regular large numbers of heavy bombers. As a lad in 1946 I went on holiday with my parents and family to Hemsby, Norfolk UK, and the remains of a crashed B-17 bomber was on the beach lying parallel to the coast line.. Do you have any record of this crash landing? i have always wanted to know the story behind it being there. Of course souvenir hunters were taking keepsakes as and where they could. I remember rows and rows of oxygen bottles behind the pilots` seats. and stainless steel bolts with their part nos stamped on the bolt heads. My father, waist gunner, was stationed also at Chelveston, England, same squadron and bomb group. He was shot down in October 1943 and ended up in Stalag 17B. Wonder if they knew each other…too late to know from my end. My father was a bombardier on the Picadilly Lily. which he flew 31 missions on. They were shot down. He passed in 1983 and I am trying to get info on him. I know there were 2 picadilly lilys his plane was the G model. His legal name was James King Merritt, his nick name was Hyde but some called him Shady. his 8th airforce bomber coat says Shady. He was from Federal Wyoming. Hmmm…… I just did a search on Google Maps for Federal, Wyo and found nothing. I was born in Lander, Wyo and so, was curious. There is a Federal Way, WA however. I was a lead pilot in the 398th BG. I flew 30 missions including 15 lead missions. My rank then was !st Lt. About 50 years later ,after a review by the Air Force, my rank was changed to captain. 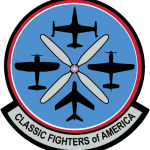 I am a member of the Eighth Air Force Historical Society and a member of the 398th Society. I contributed to the Aluminum Ovecast and have visited the B17 in the Moody Gardens Air Museum in Galveson, Texas. Wow Herb… thanks so much for writing in! We’d love to hear more about your experiences if you have the time to relate them. My Dad was a B17 pilot, he flew 60 missions with Patton. I know that he brought two planes back that could only be used for parts. I wish I knew more, I was 13 when he died and was not mature enough to ask questions. The one thing I remember is that he said that sitting at meals and seeing friends missing that didn’t make it back. Capt. Mann, my dad was a ball turret gunner on the Van Opdorp crew in the 398th BGH, 602nd squadron. I am a member of the 398th Memorial Association and have done some photographic work for the website. I have taken a ride on Aluminum Overcast and was brought to near tears by the thought of how much courage it takes to climb into an aluminum tube that will be a target for both fighters and ground guns several times a week, knowing that every moment may be your last. My dad told me once how it felt to see, from his grandstand seat below the plane, crews he knew spin down, giving their all for us back home. So sad. Thank you so much for what you did. We can never repay the debt. AFTER 2 TOURS IN THE RCAF ON CF100’S IN GERMANY AND 2 YEARS ON AN ARGUS SQDN I SPENT THE SUMMER OF 1965 ON A B-17G/350+ HRS DOING PHOTO, MAGY AND APR WORK WITH KENTING AVAITION OUT OF YYZ. JIM MONTEITH/CAPT AL BODNAR/CO-JOE CAN’T REMEMBER FLT ENG. ON MY RETURN FROM REMAPPING MALASYIA IN THE SPRING OF 1966 I JOINED THE AIRLINES AS NAV ON A TEMPORARY BASIS AND RETIRED 32 YEARS AS MGR FLT TECH. Thank you for your service Cliff Beck. I only have one criticism Sir. It is in no way a complaint towards you or your comments. I would just ask that you not write in all CAPS please, for 2 reasons, The first one is that I personally find it hardly to read, but secondly, it is generally thought that anything written in capitals is yelling at the reader and I am sure that was never your intent. I hope you take this the way I intend it and that you are in no was offended by my comments. I found the info you wrote quite interesting. Thank you again for your service and for the info. Jack, seriously… a living link to our heroic past comes to share his experiences, and you berate him for all caps?!? What’s wrong with the world? My uncle, Patrick (Pat) F. Sullivan, Jr. of Sanderson, TX, was co-pilot on B-17 shot down behind the lines over France or Germany. . He parachuted, was taken prisoner for a time. I have a photo taken from a plane flying above, of his plane going down in flames. I will try to find the photo. Does anyone know him or any of the crew of that plane. Will do more research. Is there any info about a B-17 that crashed in Puget Sound off Steilicum, WA. in summer 1943. My husband witnessed it. He was 15. 3rd. mission. He and his crew all landed safely via parachute and he was allocated to Stalag 1 Luftwaffen POW cam near BARTH in Germany. He was liberated in 1944 by elements of the British 7th. Amored Division. IF you have any photos of John, or his squadron or Bomber Group I would be so grateful if you could get them to me at my E.Mail address. My dad, Donald R. Gode was a tail gunner on a B-17 that flew out of Foggia, Italy. (The Mighty 8th, 97th bombardment group). He passed away 3 years ago at the age of 90 but not before finally telling stories about WWII that he wouldnt share with us while we were kids. He wanted us to know what they all went through and to know the little things like when you bailed from an plane, your shoes were around your neck or in your coat and not on our feet. Ken Bragg the pilot of this B17 was married to my aunts cousin here in the V.I. grew up hearing this story all my life have the picture of the plane and him on my wall at home.passing the story on to my kids and grandchildren! He was a great man full of life!!! My father, Ralph Kittle, was the pilot of The City of Savannah of the 388th bomb group, shot down on the crews’ 13th mission, after bombing Plauen, Germany, on March 5, 1945. That is the name given to the beautifully restored B-17 at the 8th Air Force Museum in Pooler, Georgia. It was dedicated in February of this year, a wonderful day. Less than 6 weeks ago, I received an email from a 20 year-old man in the Czech Republic, who 6 months ago found the crash site of the original City of Savannah. He is clever enough to have figured which plane he found and through the internet found me. He is full of questions about the crew and the missions of this plane and is already extremely knowledgable. I just received a package from him that contains small relics that he recovered at the crash site, a very moving experience. 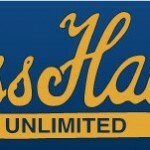 I sent him a baseball cap and T-shirt sold at the museum with the CIty of Savannah logo and outline of the plane and told him that no one has more reason to wear that City of Savannah hat than him. It is remarkable to meet a young man who has such a strong grasp of and interest in history, and startling to be the recipient of those relics of war. Wow!!! This is a very moving account of what can happen all these years later after that horrible war and the terrifying experiences that those flight crews had to endure. It is rewarding to realize that there are some individuals like this young Czech who make the effort to learn about the history of the crashed B-17 he found and make attempts at contacting the descendants of the crew members. There are lots of good people out there in this world. represent the best of America and willing to fight for “freedom” It seems youhave shown your past interests and efforts in keeping America strong and free. Liberty is not cheap, and we all know vets who have spent their life with the pains of war, even today, as North Korea is again saber rattling. To all you servicemen and their families, for all the many wars since WWII, thanks for your service. I still wear my dog tags. My Uncle Frank Clemons was B17 pilot. I made a You Tube video as tribute to my Uncle and his crew. There was no crew photo taken so I’m still trying to get crew photos and his crash site off the shores of Cuxhaven Germany. Four of the ten men survived, my Uncle did not. Please watch the full story. A lot of B17 info is covered by jack Scoltock’s Book- The Meltin’ Pot now on Kindle. That it was, and Boeing loved to brag about its survivability. I recall at least one Boeing ad in a wartime National Geographic that used the in-air photo of All American III cut nearly in two to show the ruggedness and great airworthiness of the B-17. > Steve, How nicely stated, on this Memorial Day weekend I want to tell you Thanks for remembering “America’s Greatest Generation” and those who gave their all and others who suffered then and many still to this day! My father Ernst Knobloch was in the 97th BG 414th Sqdn. He was asst. crew chief on the B-17 Kwityurbitchin II. He served in England, North Africa, and Foggia , Italy (Ammendola). He served 33 months without leave. James Bracewell from Iowa, also in my fathers group verified the story that the All American was stationed in Africa and landed there not in England. James also flew the first 11 day light bombing raids from England, he was a tail gunner. Von L, from looking closely at the letter with crew signatures on it, G. Boyd Jr. does seem to be the name and signature of the co-pilot. The signature is fairly clear and certainly not Godfrey Engle. Anyone else notice this? My great grandpa took the picture. When he was flying. Was your grandpa a photographer or one of the flight crew? For me, WW1 & WW2 brought about the bravest and most courageous of soldiers, both ours or the enemies’. They literally face their deaths once asked to go to their area of conflict. I salute all of them. But for me , the flyboys really the best there is. Imagine facing machine gun, Ak-aks, counter foghter planes, and they have no place to cover, just using their expertise with the machines at their hands! I envy their courage! God bless all of them! I knew the ball turret gunner of that bomber in the photo. He was Eldon Conda the long time (40 year) Burlington County NJ Surrogate and public account. I herd the story years ago as a kid and was always impressed. Eldon was also one of the nicest people I’ve known. God bless him. I was hoping to see the name of our dear friend, Harold Bartee, who was a navigator on the B-17 that was shot down. Harold and one other crew member parashooted but were captured by the Germans and made POW. Harold got a broken ankle upon landing. Both he and the other crew member escaped from the prison and got to some friendlies in Italy I think he said who got him back to his unit. Harold was a really great guy and friend for many years. He retired to Brevard N C and passed away a few years later. I know he attended reunions with some of his former buddies. RIP Harold. Thanks very much for adding to the story Billie… Harold Bartee must have been a remarkable guy! I can’t understand the confusion. Some of the details might be in error but my great-uncle was the tail gunner on this plane. He gave me a copy of the photo of the plane flying with the tail just about cut off. Sadly I lost it. I think some dickheads just love to poke holes in real heroes stories to make themselves look important. Just because it didn’t land back in England doesn’t make the story not true. I suspect someone edited it years later without knowing the facts. I got the story first hand from my great-uncle. He always said the mission was in Africa, they bombed Tunis. He never mentioned flying on to England. And he did have to stay at his post in the tail. I don’t recall him claiming he was trapped. It had to do with balancing the damaged tail. Comments on video and/or description welcomed. I was 14 and lived in Belgium when the first B-17 started to fly by day over Belgium, with target Germany. We were always thrilled seeing them, often escorted by Mustangs. My father was part of the Resistance and our house in Antwerp was a safe house, where allied airmen who had been shot down but not taken prisoners, were brought by members of the underground, spent the night at home, and were escorted the next morning on their long journey to Portugal, from where they could go back to England. We hosted such brave men 7 or 8 times. Wow!!! That is an incredible story Jacques! Many thanks for writing in, and for your family’s bravery. We’d love to hear more! My uncle Seaton Arnett may have been on that mission, unless it happened during the period when he was sick with the flu. He was with the 301st group, 419th squadron. He passed away in 1994, but I posted his war diary to my website. Growing up in Oak Ridge, TN, I had a German language teacher in high school who once related some of her experiences as a little girl in Germany during WW2. As the allies bombing campaign reached a crescendo in late 1944, she and her family relocated to their grandparents farm to escape the night time bombing around Frankfurt. Unfortunately, their village lay beneath on of the bombing stream’s paths, and isolated random bombs would fall on them from the stream. One day she and a friend had been picnicking in a field and watching the bomber stream pass overhead. She said it took more than 4 hours to pass them completely. As they began riding their bicycles home, a pair of what she later learned were P-51’s roared downed their little road and they both crashed their bicycles in took cover in a ditch. When she looked up, both of the planes waggled their their wings as if to say they were sorry for frightening them, and one of them pulled up into a loop and came down the road again. the plane was flying much slower and wagging it’s wings so they stood up and waved, and the the canopy slid back just a little and something white fluttered down and landed a short distance from them, and then the plane speed up and faded into the sky again. It was a scarf tied around a small tin of ham and some bread and 6 chocolate bars. I can only guess the pilot had thrown out his ’emergency’ rations on impulse, to the children. Back in 1951, I worked at North American Aviation in Columbus Ohio. I was 19. My dad was a ball turret gunner in the 384 Bomb Group. Spirit of ’96 had it’s tail section blown clear off on Sept. 24, 1944 and crashed in Wiesbaden, Germany. The famous photo of the plane flying is from the Flying Flitgun 340th bomb squadron 97th bomb group. I know this because the Flying Flitgun was my father’s plane and it was famously named by Margaret Bourke-White. My dad was the ball-turret gunner on the Flying Flitgun and saw the accident happen. This is a great story, especially to me, since my great granduncle was the radio operator on this plane, Paul A. Galloway. Not sure of the accuracy of all of the details, but my wife’s uncle Paul Galloway was the radio operator on the “All American”. He told me that the name “All American” was chosen because the pilot was an “All American” football player in college. I cannot verify the correctness, just what Paul told me. I’ve been in his country farmhouse. He returned to farming in Wilson County, N.C. after the war. He has one great-grandson. He told me that at his station on the plane, his hair cream (remember photos of men’s hair plastered down?) made a “grease spot” on a bulkhead at his station where he leaned against. He told me that on one flight there were extra boxes crammed into his station and he could not sit at his “usual” spot. The bomber was attacked by a German fighter, and a bullet hole was “dead center” in his grease spot. I had the honor of having (then Captain) Bragg as an Instructor Pilot while in training at Dyersberg, (TN) U.S. Army Air Base in June 1944. We flew a B-17G to England in Aug. ’44. 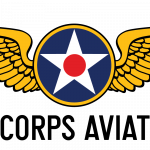 Assigned to the 95th Bomb Group we flew 35 combat missions finishing up in early March ’45. We had the misfortunes to lose our Copilot and Navigator, on the first and tenth mission, respectively. After the war, in a conversation with the late Hank Abts I learned he knew Capt. Bragg as they were in the same Aviation Cadet Class. In fact, I have a letter that Bragg sent to Abts after the war. As a boy in Schleswig-Holstein, Germany I saw a bomber, I assume a B-17, shot down by a fighter , come apart in the air, and crash in the woods just outside the small town of Kellinghusen. I counted seven parachutes. We heard that two bodies had been taken away. The fighter picked it out of a long stream of bombers headed east. The action was so far overhead that only faint tock-tock-tock sounds reached me ears, calling my attention to it. The bomber lost bother wings, which fluttered down slowly like leaves. When the fuselage landed it caused a huge explosion, with flames shooting high above the trees. As best as I can remember that happened in August 1943. 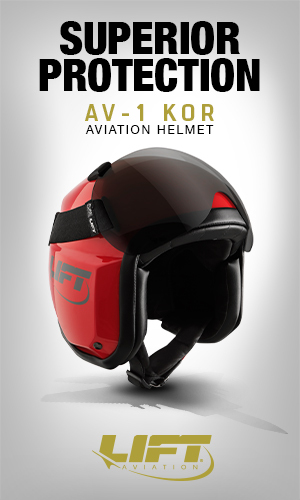 We heard, or possibly I even saw–it’s been a long time–the fighter pilot appeared at the crash site with a bandaged head. Can anyone identify this B-17? This story is true!! – My Uncle Sam Sarpolus was a on that plane as the tail gunner. He had the bullet wound in his back and spine that troubled him the rest of his life. My uncle Sam also did radio interview about his experience when he got back to the states. He never thought he would make it – just hoping the tail wouldn’t fall off besides being wounded. With some research you can find in the federal archives and listen it. I would like to thank all contributors to these stories I am reading in amazement, and….as if I were there in the planes and a part of each story. Please do not let this history die. These stories are what made the America we live in today, the Free Country so many today take for granted. The current and last few generations been dumbed down and don’t even realize why we have the many freedoms we enjoy today. I am a 60yr old male who has no knowledge of any military aviation relatives. Supposedly I have a deceased uncle who partook in the Normandy invasion. I only know what my deceased mother’s sister has told me. My deceased father was a Marine who I never heard any war stories from as my parents separated when I was a small child. My love of aviation led me to become a Coast Guard search and rescue aircrewman on helicopters in the late 70s. I have been fascinated with aviation all my life. I remember watching the TV series 12:00 O Clock High as a child. I could read military history forever and not get enough of it, especially aviation. 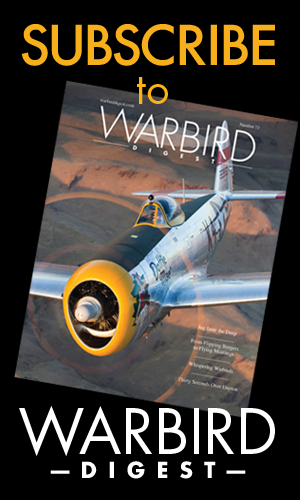 I found this site by accident, just looking for warbird stories. I have followed and read any and all links within these stories. Again I want to thank you all for keeping this part of American History alive. 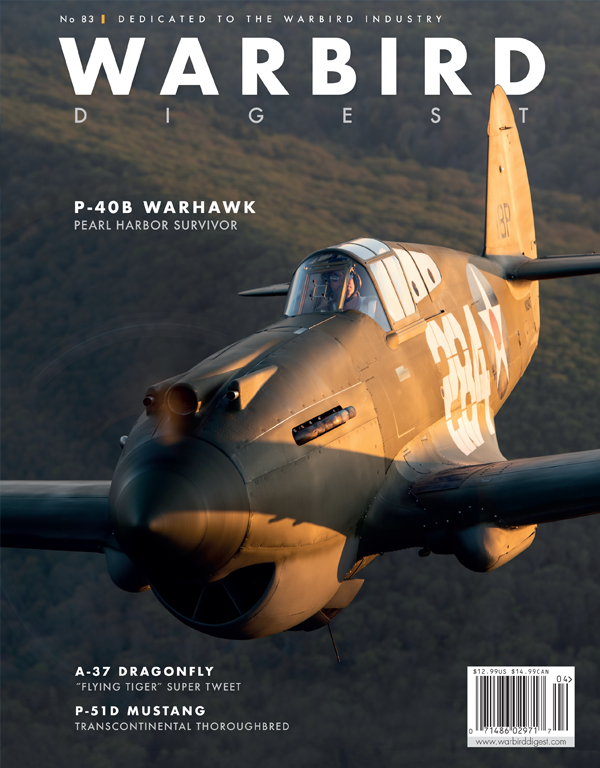 Thank You Warbirds News! The original story has been floating around on the internet for YEARS! I fell for it, as I tend to give stories of the Greatest Generation maximum respect. I sure wish I could meet up with some of these internet idiots that take a PERFECTLY OUTSTANDING STORY and modify it for their own perverted reasons – they would get a great swift kick in the behind (Polite way of putting it).